What&rsquo;s Unique About Trim Down Club? The Trim Down Club focuses on helping you get the body that nature intended for you. The program puts an emphasis on eating healthier, more nutritious food. The Trim Down Club is a customized 8-week diet plan that gives you tools for better eating habits, a large collection of tasty and satisfying nutritious recipes, and accurate nutritional advice to help you make better food choices. What’s Unique About Trim Down Club? The Trim Down Club stands out for its competitive pricing and its focus on your all-around health instead of narrowly concentrating on losing weight. The setup of choosing your favorite foods and understanding your nutritional intake makes it similar to Weight Watchers Digital, but for a fraction of the price. The Trim Down Club does all it can to present a service that you’ll find easy to use, so it offers a quick start guide which gives a basic overview of the whole program in 15 minutes. This way you can get started quickly without spending too much time reading long instructions. The Trim Down Club takes everything back to basics by focusing on healthy eating. You won’t find any prepared foods or expensive diet supplements; just good old-fashioned healthy eating that is based on science. Trim Down Club is a members-only service, so the first thing you need to do is to create an account. Once you do so you’ll go straight to your main dashboard, where you can easily access the menu planner, diet journal, recipes, and forums as well as check on your progress in the 8-week plan. To use the menu planner, you’ll be asked questions about your weight, height, and body shape. In addition to describing your appearance, the menu planner quiz also lets you choose whether you prefer a greater variety of foods or fewer recipes so that foodies can request a whole range of different recipes while people who don’t enjoy cooking that much will be given just a few recipes for their meals. You can also choose to get an instant menu, to customize it a little based on your favorite foods, or to take the time to choose every food on the list in accordance with your preferences. Trim Down Club also generates shopping lists from your menus to make shopping easier. Once you’ve received your menus you can get started on your 8-week plan, which is meant to set you on the right path towards healthy living. The 8-week plan presents exercise videos as well as healthy eating advice. You can also access plenty of tips, guides, and support through the extensive blog articles on the site. If you’re already happy with your weight and just want to adjust your lifestyle to maintain a healthy diet, you can choose the ‘maintain’ option when you set up your menu planner and the software will adjust the meals accordingly. If you want to keep losing weight, remember to generate new menus each week that are tailored to your new weight. Menu Planner is an advanced software suite which supports you in planning what you’ll be eating, one week at a time. My Menus is a tool that holds on to all your past menus and helps you compare them to your progress so that you can discover which menus are the most effective for you. The Progress Meter invites you to enter your weight every 3 days so that you can see your trend and boost your confidence. The 8-Week Plan is there to kick-start your weight loss by guiding you through menus, nutritional advice, and exercise videos every week. Diet Journal makes it easy to record your eating habits and exercise on each day’s structured form. Forums let you compare notes and share tips with other members. One of the great advantages of using Trim Down Club is that it encourages you to exercise and develop overall healthier habits, not just to lose weight through food control. There’s a section on each day’s diet journal for you to record your exercise and every week you can view exercise videos to match your progress. The Trim Down club’s biggest strength is the variety of foods members can enjoy. Trim Down Club really lets you personalize your meal plans because it believes that you’ll follow the diet better if you enjoy what you’re eating, so you can choose food types, then specific varieties of foods within those types. Once you receive your week’s menu you can still switch foods if you don’t like them. 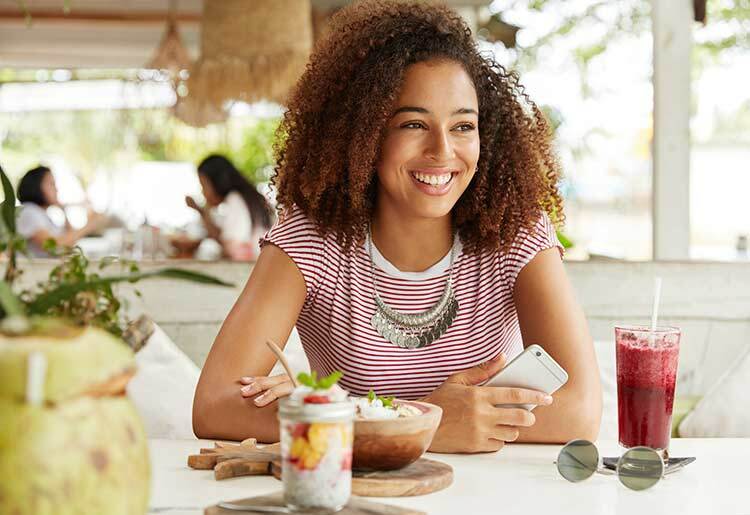 Trim Down Club shows you how healthy each menu is using a percentage rating system, so you can see if all of your changes for your favorite foods went too far and you need to replace them with healthier alternatives. Trim Down Club doesn’t forbid any foods, but it does guide you to careful portion control and instructs you to spread your treats out across the week. Each day’s menu includes 3 meals and 3 snacks, so you should never feel hungry. Although there isn’t a point system like in Weight Watchers, the approach of permitting treats and snacks is very similar. Trim Down Club has a list of ‘free’ beverages, herbs and spices, vegetables, and spreads which don’t count towards your permitted food intake that day. Trim Down Club has one simple price for all members, without any tiered plans. You can try it out for the first month for a special price of $1.99, and then pay $9.90 per month after that. A subscription to Trim Down Club includes use of all of the tools and features, unlimited menu planning, access to user forums, and support. You can cancel your Trim Down Club subscription at any time and finish the month that you already paid for. Trim Down Club has extensive support materials both online and in the form of downloadable eBooks that you can read offline. There are many helpful blog articles and advice about healthy foods, better shopping, and saving money while losing weight. The FAQ section is thorough and the user forums are active, but there is little real-time professional support. You can only get in touch using the web form for email support, there’s no phone or live chat option. Trim Down Club is like an economical version of Weight Watchers Digital, with advanced software that generates very customized menu plans and encourages you to live a more healthy lifestyle overall rather than to just lose weight. If you want to change your eating habits but don’t want to cut out your favorite foods, Trim Down Club is a good option.